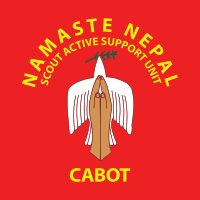 The Namaste Nepal Scout Active Support Unit exists to develop Scouting in Nepal. We do this in many different ways, such as visiting Nepal to pass on our skills and knowledge, providing guidance and encouragement on how to develop Scouting or by funding things that they may not be able to easily afford. If you would like to make a donation that will be passed directly to Scouts in Nepal, please complete the form below.